On Wednesdays between April and the end of October we offer a weekly ‘drop-on’ tour. No booking is required, just turn up at our meeting point outside the Guildhall and join the group. Please call in advance if you are coming specifically for the tour – Dawn is the guide for all the tours and does occasionally take a break or lose her voice! 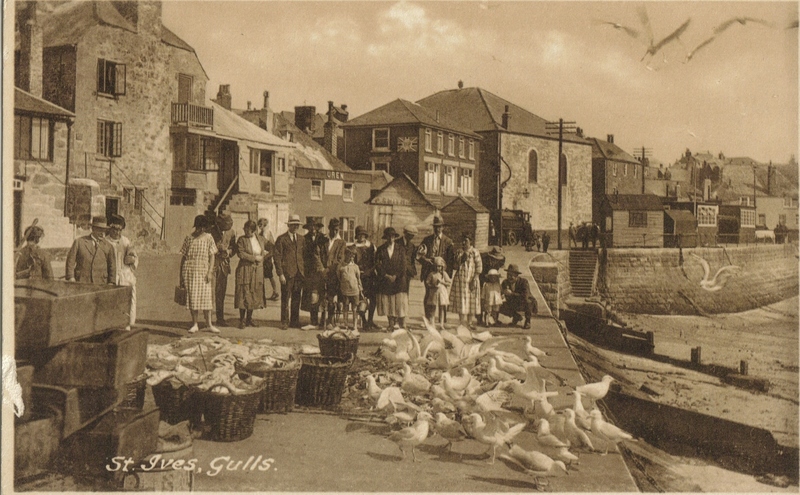 The Story of St Ives tour will guide you through all these facets of the town’s history, providing insights into the lives of people in the town throughout the centuries. We will take you on a leisurely walking tour of the town, stopping at notable landmarks to relive key moments of the town’s history. St Ives has a fascinating history – from its roots as a remote fishing and mining village, to its position in the mid twentieth century as a world-renowned centre of modernist art, and now as a well-loved holiday destination. You will have plenty of opportunities to ask questions about the past and present of St Ives. Who will enjoy “The Story of St Ives”? This tour is for everyone who wants to learn more about St Ives. From people who have never visited St Ives before to those who have been coming every year for 40 years! We have lots of visitors who lived here as children, and some whose relatives emigrated to Australia to ply their trade when the traditional industries of mining and fishing went into decline. You will meet other people on the tours who have their own stories to tell about the town – like the swimming lessons the school held in the harbour, the silks drying on The Island, or the Radio One Roadshows! The Story of St Ives tour takes place as a drop-on tour every Wednesday at 11.00am from Easter until the end of October. It lasts around 90 minutes and departs from outside The Guildhall on Street-an-Pol (follow the signs to the Visitor Information Centre). There’s no need to book – just turn up around 10 minutes before the tour leaves. The tour takes in all the places of interest in a leisurely walk, finishing at the Tate St Ives at around 12.30pm. The tour costs £7.50 per person, payable in cash or by card to the tour guide, please. The tours run in all weathers, sometimes necessitating detours, but they are always fun and informative and if the weather is really impossible we can always shelter somewhere or drop into a local café and continue the talk inside. However we are usually lucky! If you cannot make the drop-on tour, please call Dawn on 07816 180639 to arrange a private walking tour at a time that suits you. Cost : £7.50 per person (under-12’s free). Pay Dawn on the day by cash or card.